Drowning incidents occur in Australia every summer resulting in the death of many young Australian children. It is essential to protect your pool with a pool fence that complies with the current Australian Standards. The installation of a glass pool fence provides a barrier while adding to the visual appeal of the pool. Glass is a transparent material, which does not block vision to the pool area enabling clear supervision from any angle. 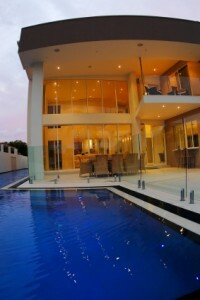 Most glass pool fencing installations create a seamless appearance that is strong and durable. They are also very difficult to climb over because they have fewer posts or slats, which children use to propel themselves over the fence. Another key advantage of using glass is that it requires little maintenance, as glass is not affected by the sun and weather. Glass pool fencing must comply with current Australian Standards therefore it is imperative that the installation is carried out by a qualified glazier. Failure to have pool fencing installed properly can result in the home owner being legally liable for costs relating to injuries or death due to poorly installed pool fencing. No doubt glass pool fencing improves the appearance of any pool but they must meet the strict requirements of the Australian Building Code.